"Just because you can't see them, it doesn't mean they're extinct." The above info came from Colhan3000@, and was edited by yours truly (contact me). The image came from Lost Edens. Quent is an ex-sheriff from the town of Kyrios. He hunts wolves after blaming them for the destruction of his town and death of his family. Quent is Blue's owner, Quent son found Blue when she was a pup out in the woods. He is very fond of alcohol and is seen sometimes in a bar or drinking from his flask when he's not looking for the wolf pack of Kiba, Tsume, Toboe, and Hige. When he finds Blue in front of a dead body he thinks Blue was the one who killed the person and points his gun at her. Scaring her off he don't see her again until later, he reviles that somehow he always knew she had some wolf blood. 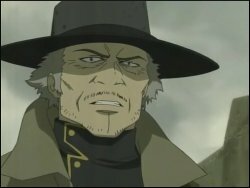 Near the end of the Anime he is seen traveling with the wolves including Blue along with Cher and her Ex Husband Hubb. It is during this time that he soon learns that it was Lady Jagara's men that destroyed his town to flush out the wolves. He also learns that the true murderer of Quent's family was Darcia, who was in his wolf-form when he killed Quent's family. The above description came from Colhan3000@, and was edited by yours truly (contact me). This is a man who has nothing to live for, nothing to lose, and who's only existence is to hunt a creature which everyone is sure does not exist anymore. Quent used to be a family man, used to be a sheriff in a tiny little hamlet of a town with his wife and his son, along with a little pup he found to be his son's pet. One day, this all changed. He came home to find his house on fire, nearly already burnt to the ground, wolves among the flames, eating the cooked flesh of his son and wife. Quent could only watch in horror until he gathered his senses, and his rifle, and fired on the wolves. This would be the start of his new life. With Blue, the dog that was once his son's pet now acting as a guide to sniff out wolves, he hunts them down relentlessly with no other purpose in life. He walks around the world with his dog leading him along with a leather leash and a spiked steel collar. Quent himself wears a light brown weather worn trench coat and a gray warn fedora hat. He has a black button up under shirt with golden trim and buttons. He also has large leather straps under his coat that hold his gun in a holster. His gun is a cross between a big revolver and a short rifle, a short barrel rifle with a revolver chamber, and a pump hand guard for quick cocking with each shot. He also carries around a briefcase, holding all of his worldly goods with him as he travels around from place to place. His face is old and wrinkled, but with a look of determination, his pupils very small and his eyes blood shot. He also has a very unkempt hair style from always wearing a hat and has lots of facial hair from hardly ever shaving. Quent continues to hunt wolves in order to take revenge for his wife and son. He drinks almost constantly and when he is not in a bar he almost always has a brown bag with some kind of strong liquor. He drinks for two reasons, one is to help dull the pain of his loss, and the second is that when he is drunk he sometimes is able to see past the charm that wolves place on people that lets them appear to be human. This combined with Blue's ability to sniff out wolves makes him quite a pain to Kiba and the rest of the wolves. He hunts them down relentlessly, eventually running into Hubb who is in search for his wife. They travel together because Hubb knows that his wife Cher is chasing after the wolves that have Cheza, and Quent is tracking down the wolves anyway. They don't get along very well, Quent being a quiet person, but they tend to get along better when they are both drunk. Eventually Quent loses Blue, but he does not stop his hunting. When he eventually finds Blue again, but in a human form and knowing she is part wolf, he utterly disowns her, much to her sadness. He will never forgive wolves, even when Blue desperately tries to tell him the truth. Side notes: Quent's eye color is very hard to tell, since most of the time his pupils are so small that they look like dots; probably the animator's trying to make Quent look more determined and filled with thoughts of revenge. It's a wonder Quent can keep on the wolve's trail, since he almost never stops drinking, trying to drown his inner pain. Quent often would give words of encouragement to Blue when they would move from place to place, telling her that she needs to keep sniffing out the wolves, that they are nothing but pure evil and that every last one needs to be killed, eventually causing Blue to become very conflicted with herself when she realizes she is part wolf. The above description came from Kefka989, and was edited by yours truly (contact me).